Google Sesame Street logos are taking over! – ¿¡ tjongolongo ?! Google Sesame Street logos are taking over! As you may have noticed, Google celebrates 40 years of Sesame Street this week. Special Google Doodles have been created featuring some of the Sesame Street characters. I can’t actually believe that Sesame Street has been around for 40 years already! From a tv show to a Google Doodle on the internet. They may be 40, but they are keeping up with the times! Tjongolongo, they do look good on the doodle’s dont’they? My favourite so far is Cookie Monster! I think it’s nice to see how Google changes its logo for special occasions like this, it keeps people informed and you keep attracting people to your search engine, which is pretty smart marketing as well ! Because everybody wants to know what Google comes up with! But then again, who doesn’t use Google these days. I forgot to mention that the Doodles can differ per country sometimes containing characters from that specific country. I will keep posting new Sesame Street Doodles as they appear on Google. 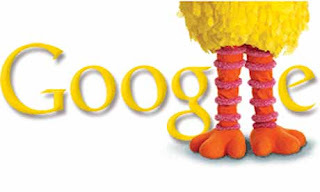 Which Sesame Street character would you like to see take over the Google logo? How to make recycling fun? Yeah, totally makes me feel old now! Remember Electric Company? Deb – Actually I don't remember, they didn't show that in the Netherlands. I Googled it though and found a clip on YouTube. I think I would've loved this show as a kid! @ Jeremy – The Count is cool indeed, but Cookie Monster is still my favourite!